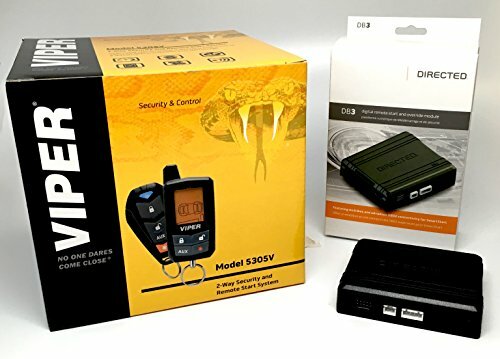 Our Brand New Combo includes 1 Viper 5305V- 2-Way LCD Security Alarm & Remote Car Starter & 1 Directed DB3 XPressKit DEI Databus ALL Combo Bypass / Door Lock Interface. You can start your engine from up to a quarter of a mile away with this Viper remote start system. The Viper system comes with two 2 remotes (1 with LCD display) and several features, such as keyless entry and SmartStart compatibility, up to 1/4 Mile Range Viper SmartStart compatible Keyless Entry. The LED screened remote allows you to confirm all commands with the LED screen on your four-button LCD remote with on-screen user interface. There is also a four-button one-way remote included. Some DB3 Databus Interface Module Features: -All-in-one comfort & override module that covers over 95% of vehicles on the road today. -Multibus and advanced OBD2 connectivity for SmartStart. - RSR/RXT compatible - Customizable features with DirectLink - Vehicle specific T-Harnesses - RF loop compatible - Unique module ID allows for history lookup - SmartStart compatible -Includes (1) DB3 Module (1) Main harness (1) secondary harness -Will support legacy systems like VATS and PASSLOCK as well as support doorlocks and override on the most modern of cars like Toyota with pushstart ignition system and Chrysler with electronic ignition. • The DB3 offers the most advanced hardware architecture in our industry and covers more cars than any DEI competitors. We, at Click & ADD, offer you FREE FLASHING/programming if you e-mail us when you place your order the following information: -Car year, make, model -Engine type (hybrid or non) -Ignition function/key type (smart key, standard key or push to start) We will conveniently e-mail you the installation/wiring guide. Start your engine from up to a quarter of a mile away with this Viper remote start system. This system comes with two remotes- 1 of which has an LCD display, along with many features, such as keyless entry and SmartStart compatibility. If you have any questions about this product by Click & ADD, contact us by completing and submitting the form below. If you are looking for a specif part number, please include it with your message.